It was the last thing on my mind, so I was totally taken back when I stepped out onto the deck to call the dogs. Man, it's slippery! It's... S N O W? Oh my! Again! You know, wait a minute! We don't get snow this often! This is really strange! We live near Tillamook! Bill is off to Newberg for a meeting with the Steelheaders! How could he possibly go with the lowest route, looking like this? Oh well, he's on his way! Then I found out that his meeting for the Steelheaders this month is the 14th. That's Valentines Day! What better way to celebrate love than with the Steelheaders? It'll be a wonderful day, doing what girls love most! We are fishing together with Chris Vertopoulos! I can't wait! Side drifting! How romantic! Can you even imagine? I can't wait! Stan Fagerstrom's column is out! Have you read it? I posted it yesterday. It's the second part in a series on braid. Read it! If you missed the first half, check out Stan's archives! He writes alot of great articles! Hey! Have you seen this? This Spring Chinook Bulletin is awesome! This took a ton of work and is one of the best pieces of information that I've seen put out! Way to go, Steelheaders! If you aren't a member, please sign up, here! Wow! I didn't know there was still a picture of me on that page! :) Cool! That was such a fun thing, being chosen for the Hall of Fame! I wonder who will get it this year? I know of some pretty wonderful candidates! I suppose the talk of the town and the action around my house is readying for the Sportsman Show! Here is a link where you can find people's booths, and perhaps even post yours! My truck is filled to the brim with Kwikfish! Man! Everyone is excited about the Salty Dog Convention! There is an actual page made by Ocean with all of the details that you need to know. Please click here and sign up, soon! I'm going to attend the dinner! Bill has been doing really well out back, fishing. I haven't, so much, but I've determined that cameras are like bananas. Don't take them with you! I'm going out soon to try my luck and I'm not bringing a camera, darnit! Feb 8th is the Spring Chinook Allocation meeting. Don't miss it! Read about the free bus to get there! Well, we'll wrap this up with a picture of a steelhead, taken out of the Wilson river. Things are going nicely around here! It's my favorite time of year! "Slow on the Wilson" was his chosen title for this thread. Doesn't look like it to me! :) Way to go, Bro! I'm off to get dressed and hit the river. Can't wait! You'd better watch what you pray for. You just might get it! And, I have learned over and over that it will happen in His time. Not mine. I woke to the sounds of Spring Birds singing out the window, and yet it's only February! I lifted my down cover and peeked out to the river, still groggy from sleep. Oh, how beautiful it was! God had a wonderful plan for my day! But, here I am, feeling a bit guilty and totally fishless this morning, after giving those native steelhead all I had. Years ago when I first moved to Tillamook, I prayed for a church where I could play the piano, and be appreciated. It was the strangest experience I'd ever had as an accomplished pianist. I've always been in great demand for my playing, but not here in Tillamook. In fact, one rather bold pianist who had lived in Tillamook for years warned me when I asked about it, "Don't think you'll just come to Tillamook and take it by storm!" Wow! I was shocked! Not only was I used to being accepted with open arms, but I usually have to turn down invitations. It's just different in Tillamook. If you have had a dairy farm for years, you are auto-accepted. If not, well... looks like you never will be! I keep mostly to myself, here. Me, and the river. I've come to like it that way. My girlfriend, who was also new here noticed the same thing. She said she'd lived here for 8 years, and had made 2 friends. TWO! With no answer to my prayer, I commuted to my old church in Warrenton. After a while, the commute really got to me and I quit. Three years of hard praying and commuting didn't hook me a Tillamook church. I guess it wasn't His time. More than a year ago, David Johnson talked to me about a church he went to. The church was a bit more charismatic than I'm used to, and it sort of scared me off. I didn't go. I meant to. I meant to try it. But, I didn't. That church dissolved or moved, and David began to have church at his home. I was invited, but again, it didn't happen that I went. Well, about a month ago or more, David told me about a new church he'd found in Netarts. They didn't have a pianist. (!!!!) It was a grand church, he said, with a great congregation. It sounded awesome! I was excited! Was this "His" time for me? But, for three weeks in a row, I've failed to attend! I was sick, or out of town, or busy! And every single dog gone time that old childhood church guilt caught hold of my soul. 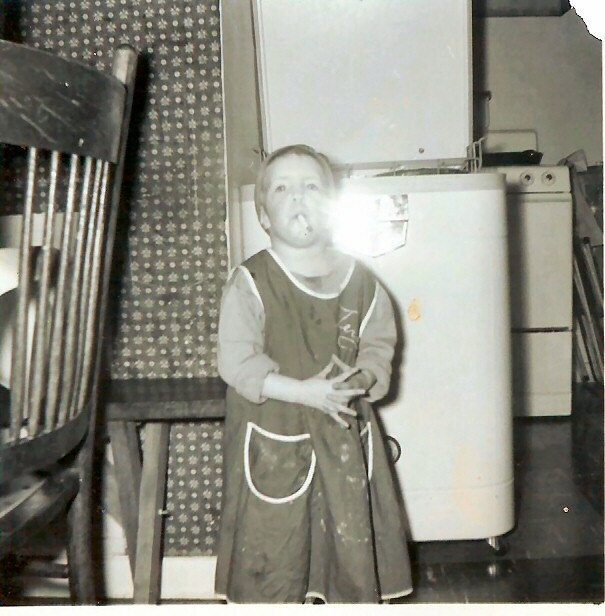 Guilt that I remember from my childhood that actually sent me packing away from Christ, away from church, far away from a Christian family or congregation. I had no support group, and frankly, I liked it! I was free! I was far, far away to places where it isn't safe or good for your soul. In those troubled times of my youth, I learned things that essentially sent me back home again. Thank God! I have evened out what I believe, now. Unable to shake the hurt that was formed by making me feel guilty, my faith now includes a resistance to making others feel guilty. I believe that it drives our youth away. I don't think guilt is a good thing. I do believe in consequences, however! In my "back to church" days, I had the normal learning-lessons of a church congregation that challenged and tested me, but I held strong and played it out, until it came easy. I changed churches a couple times just like changing brands of mono. I learned some hard lessons, same as when my line breaks, but I always attended and eventually, I thought the knots were holding. The guilt that I feel this morning, is a combination of that old-school guilt and a more mature acceptance of the risk of consequence. We aren't judged by our good deeds, but I do believe in a very real risk of consequence for listening and not acting! I had planned all day yesterday on going to church, today. What is it about that river out back that draws me to it, no matter how strongly I feel about something else? I struggle for an answer. And so I was out fishing this morning and thanking Him for how beautiful it is on the river. Yet, that old familiar childhood guilt crept into my hands, ran fast along the line of my reel, down each guide, and right down into that beautiful water. As I fished my way down the bank, I began to think back to years of Super Bowl church Sundays and the sermons that all held a common theme. The pastor/minister would always joke about wrapping up the sermon in time for folks to get home to their television sets. I'm sorry to say, the Super Bowl isn't my excuse. On Super Bowl Sunday, most of the men that I know are glued to their television sets. (Even Bill!) This allows the rest of us less-talented anglers to fish usually overcrowded stretches of water, alone! It's girls day on the river, gals! Let's go! So, why didn't I go to church? Let me count the ways. *I got up too late. *The barometer is rising and the fish are biting. Oh-- and did I mention that it's Super Bowl Sunday? So, Ladies and Gentleman, the time has come. His time. I just may have found a church that I can play piano for. I won't know, of course, until I attend. But, it's lookin' good! Thank you, David! Thank you, God! But, did I miss a slack bite that came right at me, and I forgot to set the hook? We have to be willing to accept the gifts that are given to us, in His time, and take them. Darned if I missed more than church, today. I missed the bite, too... and I can only hope that God will permit me to have another chance. (At both!) I'll have to deal with the consequences. My worst worry of all is that if I had indeed attended church, this morning, the pastor would have ended his sermon in time for me to still be on the river... and I wouldn't have missed that bite! Thank Goodness that I'm still learning how to be in this relationship with God, and I have learned yet another lesson. Thank you for your grace and patience with me, Lord. I'll learn! I WILL! UPDATE: Due to public interest in 2008 management objectives for the allocation of mainstem Columbia River spring chinook, that agenda item has been moved up to 8 a.m. Friday, Feb. 8. See updated Fish and Wildlife Commission meeting schedule at this link. Go! Go! Go, ifish, go! We are having more fun at the Sportsman Show! So funny that every year, folks tell me to pace myself, and every year I forget how tiring it is! I'm so excited about the energy that is being demonstrated by sports fishermen and women! There's an air of hope and change at the show and I'm so thankful to be part of it! For the first time in years, I do feel positive about change. All of the sports fishing groups are coming together and fighting to save our salmon! If you come to the show, I think you'll feel it, too! Representatives of The Northwest Steelheaders, NSIA, CCA, Jim Martin, Stan Steele, everyone that I visited with yesterday had that look of determination and confidence in their eyes and I'm just beside myself! Speaking with Jim actually brought tears to my eyes and goose bumps to my skin. Go, Sports fishermen and women! We just might be pulling this off! I so wish I could attend the meeting on Friday, but no one will be at the booth to help me at that time, so I'm stuck at the show. That's OK. I'd love to go, but I'd probably end up blubbering like a baby with emotion, anyhow... so I'll stay put and anxiously listen and wait for the outcome! Please attend in my place, and show your colors! There is a free bus to the meeting, here. I'd love to do that! Can you imagine the spirit? I've readjusted my schedule a bit, so if you had plans to come to visit, don't forget to take a peek, so I won't miss you! I have to rush to get things going, but wanted to update this. It's been a while! I get so wrapped up in details at the show, that I can't sit still, so I I am starting each day with a long prayer that I will realize that the show is really about visiting with people regarding fishing and community. I'd so much rather focus on people and giving them my full attention. That really helped, yesterday, and I can tell you that I've never enjoyed a show as much as I did, yesterday! Lots of hugs and lots of smiles! I got to go visit Hawgquests booth and met Glen and his wife and even got his autograph on a sticker and on a new shirt, thanks to Hawaiian! He is more fun to spend time with! It's a good thing, because I seem to have no vision in my left eye, so Justcallmedave has been a real blessing to me! He's my seeing eye mod! Well, off I go to the showers. I can't wait to see what today brings! Remember... you can watch, here! I have met and enjoyed time with so many people! I was able to meet and spend time with Stan Steele this week. What a great guy! It's no secret that I jumped on board CCA before many of the moderators at ifish. I did so on the recommendation of someone I trust, dearly. Bill Hedlund. He talked me into it in a flat second. Regardless of my trust for Bill, Stan cemented my decision and I'm so glad to know this wonderful, peaceful speaking and intelligent gentleman. I introduced him to Pete, and we all discussed the issues that are before us in the fisheries, and I think Pete was quite impressed with his knowledge and reasoning. Pete is extremely well versed and has spent years crunching numbers, studying charts and attending meetings, learning what we face in order to restore our fish runs. That's what attracted me to Pete in the first place! There is nothing I love more than to try and absorb some of that knowledge from people in the know. Pete seems impressed by this year's attendance as he looks back and ponders the day he was the only person from ifish attending one of the previous Springer Allocation meetings. I've got to get running. I have to pack everything up and take my luggage to the show, or pay another night motel fee. I don't want to do that! I want to go see my animals and my family! I've visited with and met so many ifish members and I have to say it was one of the most valuable weeks I've spent. I took the time to visit, smile and laugh with ifishers and I'm so blessed by it all! I didn't worry about details so much (until today!) and the moderators attended the show and helped to sell things, leaving me free to shake hands and meet folks. It was nothing short of wonderful! I am so glad I did this show! I am completely fulfilled and feel so blessed and lucky! Thank you, God! I also got to spend time with my girlfriend from grade school, Tammy, last night. We had dinner (Taco Bell) in my motel room after the show, and giggled well into the night. I can't wait to get home and wet a line... to feel the familiar rocks of the river beach under my feet, to scan the vast expanse of pebbles searching for crystal treasures, and spot spawning steelhead in the riffles. Whooo hoooo! I love my home! I am just happier than any girl has a right to be. Again, thank you... my Dear, Heavenly Father. I shake my head. If this is good living, can you imagine what Heaven must be like? :) WOW! I'll update and shorten this column when I get home to the rest of my files. Have a great day! Hi Honey! I'm home! I have to catch up on things and then I'll go fishing! More, later! Look for the Home Kwikfish Mailing orders, soon! Countdown to Valentine's Day! Bill and I are fishing with Chris Vertopoulos! I can't wait and neither can Bill. Plus, I have a very special present for Bill! It's nothing expensive, but it is something very, very special! I'd tell you, but he'd probably read this! It's time! Mail Order Ifish Kwikfish! Sign up now! It's a member's only thing, so if you aren't registered, you'll need to do that, here. Then, post on the above order form, and soon I'll send you the invitation! It's first come first serve, so don't delay! I'll never forget last year. I had to mail order all of them, and what a chore that was! This year, I got to give most of them out at the show. Oh! I'm pickled tink! It smells, sounds, and looks like Spring, outside! I have to go to the doctor, tomorrow. Say a little prayer for my eyes, please? My left one just isn't seeing and it is very frustrating! I want to see, again! So, it's Portland tomorrow, and then Seaside this weekend for the Salty Dog conference! My poor Kilchis misses me! I miss him! He's so wonderful. The night I got home, he snuggled under the covers with me. I loved that! I love that dog more than any other dog I've ever had! Yesterday I was in my pajamas nearly all day, sitting in front of the computer, trying to catch up. At about noon, Bill was ready to take the dogs to the river. "Are you fishing?" I asked. "Yep". Hm... I decided not to fish, and to just tag along and play on the river. (STILL in my pajamas.) I didn't think anyone would be around. Was I ever wrong! By the time I got back, the guys were getting in their boat. "Are you Jennie?" (Blush! Still in pajamas!) "Yep! Nice to meet you!" Jennie in pajamas... great! Just great! So, off they went, and I cast... and cast... and pretty soon here comes David Johnson. You guessed it. STILL in my pajamas! I giggled and we visited and I just don't care! I mean, what's funnier looking? Pink pajamas or my waders? Either one makes me look funny! I didn't catch anything, but I was really glad I went! This morning, however, I'm headed upstairs to shower, and get out of these pajamas. I'm nearly caught up and ready to go to the doctor's tomorrow. For the rest of today, I'm fishing in real clothes!!! I'm so excited! It smells like humming birds outside! I'm going to put out a feeder and start my daily watch for those wonderful little birds! It's almost time! I know it is! And they love my pink pajamas! When I wear those outside, they are so bright and pink that they land on my shoulder! I can't wait! OK. Off I go. Wish me luck and say a little prayer for my eyes. Life is so good and I feel so blessed! I just cracked the window open and sure enough, the sound of Spring birds fills the air! Oh, no! Bill's ready to fish! I don't have time to get showered!!! I guess it's pajamas again! I gotta go! Sure, it's a 'silly' Hallmark kind of Holiday, but I still love it! I love to put pink and red things all over the house and all over ifish! I missed that, this year! I wasn't able to post on ifish on Valentine's Day and I didn't get to fish with Chris Vertopoulos, either! If I had it my way, I would decorate the house and also, the pages of ifish for each Holiday. That's how I'd spend my time! Doing things like that make me happy! Instead, I was really busy trying to catch up. So, in the spirit of Valentine's Day, and since I missed it, I'm making my column pink, today! I'm just going along with the idea that I can have Valentine's Day whenever I darn well feel like it! So, join me in Valentine's Day and do something nice for someone! Not a bad idea for every day, is it? I am leaving for Seaside in a few minutes to attend the Salty Dog's convention. I hope to be able to attend some of the classes before the dinner and auction. I've been so excited about this! Today is the day! I have to go to Portland on Tuesday for a meeting about business, and then off to OHSU for an MRI to boot! I'll have to stay overnight, since I can't drive at night. Then, I get to come home until surgery! All week I've been trying to send out Kwikfish to the people who weren't able to attend the Sportsman Show. The show was so much fun! I got more enjoyment this year out of meeting folks and doing silly things like signing their hats and stickers! It just blows me away that anyone would want my autograph! (????) Really? Me? You want me to sign it??? That's funny! But, I had fun! Since I've been home, Bill and I have been hitting the water regularly, but having very little luck. Still, it's been nicer weather, and it's very enjoyable to be down on the water with the dogs. We are going this morning, before I leave, too! I still have live sandshrimp! Francis Caldwell sent in his column and the topic is about something that has always fascinated me. Lituya Bay. Have you heard about it? Read, here! Mr. Caldwell has the most interesting stories to tell and I am so honored to have him share them on ifish! I posted it last night. His column comes out the 15th of each month. Well, it's off to Seaside, I go! I can't wait to see all the Salty Dogs and join in the fun! Bill and I put up a couple hummingbird feeders in hopes that it is almost time! I can never wait for that first one! Look at these links! I can't wait to start taking pictures, again. Spring... it's a time for hope! And it sure feels like Spring, this morning! 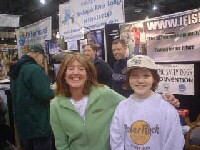 It was so much fun at the show meeting nice young ladies with an interest in my most favorite thing of all: FISHING! It thrills me to no end to know that these kids love to fish, too! 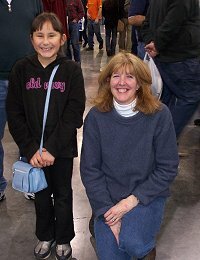 I took a picture with another young gal who has been visiting me every single year! I hope that they'll send the pic in, too! Her name is Marjorie, and here is a picture from a couple years ago! 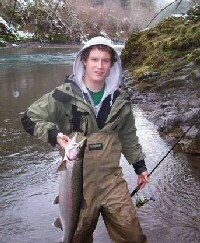 Ifish Guide Chris Vertopoulos and 3riversBob (Bob Cabal ) from Portland caught this 20 pound wonderful steelhead! So, now, girls.... we are going to be like that, some day! 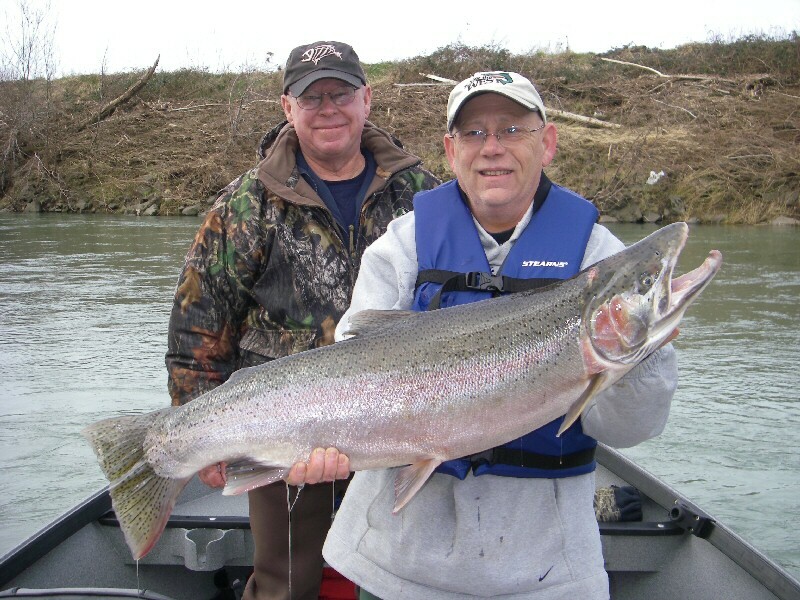 We are going to catch 20 pound steelhead all day long, just like these guys do! LOL... Chris Vertopoulos has had quite a year, this year, reeling in the big ones- and I missed fishing with him on Valentine's Day! Argh! What an absolutely gorgeous weekend it was in Seaside. That town has changed so much! It's more like what you expect in California along the coast. It's no longer the little quaint neighborhood that I knew, when I lived there. The pedestrian traffic is thick! It's nice, for what it is, but I do miss the friendly local feeling that it used to have. For what it is, it's lovely! The Salty Dog conference was impressive! Unfortunately, I was down and couldn't attend the dinner, but I did stay for a while and visit with people. I was also able to award the first spring chinook caught to "Razor Clam". I have pictures coming! 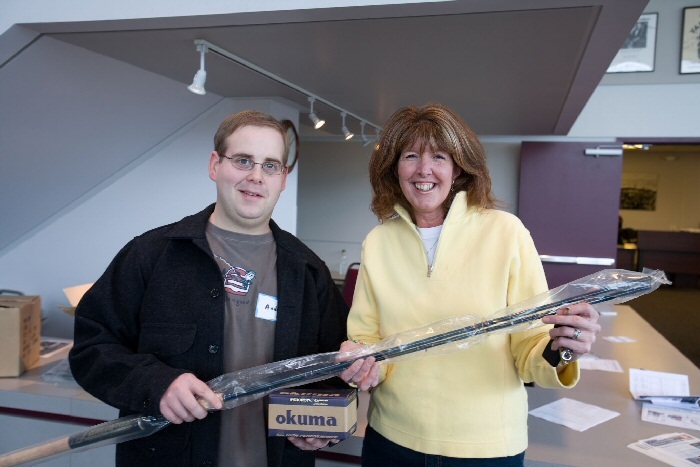 Ed Senior took some of he and I with the Lamiglas rod and the Okuma reel that he won -and I can't wait to see them! I'll post it here, and on the board when they show up! If I get my packing done, I may go out fishing, later. It's just a beautiful day! Alright. Want to see a funny picture? Guess who this is? So, as you can see. It's not my fault. My parents did it to me! Good morning! Finally! It's been so long since I wrote and it's been so, so busy! I'll catch you up on what's going on, first. I feel kind of rushed. I'm so behind on ifish, but that's what happens when you play the medical game at OHSU! You know, every evening when I lay in bed at night, I think of so many things I want to write in my column. Then, I wake up, all foggy headed, and open my mail, and then ifish. Darn it, but all the business parts of ifish start invading my head, and before you know it, I'm deep into the problems of ifish and I forget everything I wanted to write. That is why, when I met with some business people a couple days ago, I said to them, "I don't think I want to be the main person for the business side of ifish.net!" I do think I'm good at it, but it keeps me from doing the part that I love. The writing, the reading, the design of ifish and playing "ifish Mom" on the board! I keep hearing from other writers and from friends that I write with honesty. I don't know what that means, really, but I do like to spill my feelings, here! It helps me get on with my day, and when I get bogged down with business, since I have limited time to work, it takes that away from me. So, today, three days behind and with an e mail program full of requests, I shut it down, and just opened ifish. I need to talk! When I write, here, it's as if I'm writing to a dear friend. In fact, when I get writer's block, that's what I do. I pretend that I'm writing to my Mom, or to a dear friend. Then, the words flow! It just feels so good to get things off of my mind! Two days ago, I took off for Portland with anticipation and a bit of dread. I had a busy schedule, and it was all mapped out for me. I had a business meeting at 2 on (I don't even know what day it is, I'm so foggy, still!) Wednesday? -and then, have an hour and a half MRI at OHSU, that evening. A drive to Portland, and those two things is alot for me, on my own! It's sad to admit, but it's just hard on me to do too many things since my dissection. I was early to my appointment, but finally got it done. It was very refreshing to meet with a financial specialist to try to help me get off disability and become financially independent, once and for all. That's my dream! I may be crazy. Here I have medical insurance covered for me, but frankly, I don't like being on disability. It feels yucky to me. It feels like charity. I don't much care for charity. I like to give. It has always been my dream to do it on my own. I'm still trying and someday, by golly, I'll get there! I will! I will! I will make enough to pay for high risk medical insurance and to take one trip to Mexico, and I'll do it all on my own! Man, this coffee is good, this morning if I feel that confident! LOL. Their suggestion was to ask for people on ifish who would like to invest in ifish. I may do that. I'm not there yet, but I may take them up on this suggestion. So, off to a very nice hotel, downtown, where since I've been using their credit card, I finally had enough points for a night's stay. (Plus two more! Yay!) It was nice to be treated well! I have special needs and this hotel is just better at accommodating those needs than some other hotels. The room seemed squeaky clean and I counted the pillows on the bed! 10 pillows! I was in heaven! I nearly jumped and landed into these pillows at 4 PM, and before I could count sheep, was fast asleep. 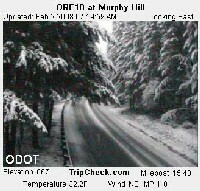 Luckily, I woke in time to take my medication, and make arrangements for a ride to OHSU for my test. I arrived at OHSU just in time and they said they could take me, right away. But.. I waited, and waited and waited. Pretty soon it was 8 PM., and I called back to see what the hang up was. You know, I have waited up to 5 hours to see a doctor at OHSU. It's just the way it is for specialists. They have emergencies and other things, and by golly, that's OK with me. If I have an emergency, I hope they'll treat me, right away, too! Anyhow, they told me that their machine broke down! Oh, great! Evening appointments are never my thing, but I took this one, because if I didn't, I'd of had to wait two more weeks for this test. At 9, I almost gave up, and went outside to call for a ride. Just before my ride showed up, the MRI people called me back in to do the test! It was fixed! It was going to be really late, before I got out, but I went ahead and did it. They hadn't told me that I would need an IV. Horrors! It is so hard to put an IV in me. My veins break and I'm the "poke" nurses nightmare come true. It hurts, too! I never know whether to tell them or not. If I tell them, sometimes they get more nervous. Five tries later and a whole lot of bruises all over, and finally, I was ready. I glance down at my arm right now and whimper at the black and blue memory. At 11:30, I finally opened the door to the room with so many pillows. I was never so glad to be somewhere! But, I was starving and all the places to eat were closed. I finally called a sandwich shop and they delivered the most wonderful sandwich to my room! I don't know that it was really that good, but I was hungry enough that it tasted like a meal fit for a queen! Even the potato chips! :) Yum! I fell asleep sitting up against the 10 pillows with David Letterman on... and woke at 5 in the morning, TV blaring.. only to fall back asleep, this time, laying down with only the sound of the city, below me! My cell phone rang at 9. It was my eye surgeon. He is so kind! (He is Dr. Hwang, if you ever need a retinal specialist!!!) His call didn't bother me until he began to ring out the details. In short, he said that my right eye needed surgery right away, due to the bleb. The cornea on my bleb is deteriorating, and they are afraid it would pop. So, a scleral patch is necessary. That surgery will be NEXT THURSDAY??? Oh my! But... that's not all. The left eye's retina is still swollen. They took some high tech pictures of it again, last appointment. So, the next thing to try to get the swelling down is.. (get this!) shots-in-my-eye!!! Yes. Shots... IN my eye! No way! I began to hyperventilate at the thought of a needle in my eye. My mind raced. How can I get out of this? "Doctor? Could we do the shot while I'm asleep next Thursday?" "Well, that sounds like a good idea! I could do that!" Smart Jennie! Yay! I can be asleep... at least for the first one! I should be a doctor, I thought! What a grand idea! Whoo hoooo! Why didn't he think of this? I asked the good doc if these shots hurt. Get this! He said, "Well, it's never appealing." What a clever doc, he is! It's "not appealing". Hm. Smart doctor! Good way to say it! So, now you are caught up. Now you know where I've been. For all of you that have written, "Jennie? Are you OK?" Well, yes I'm OK. I just haven't been fishing. I just haven't been home with my dog, Kilchis, snuggled up in my big bed with the windows open, listening to the lullaby of the river. I haven't been out fishing. I haven't been out counting agates, looking for the ones that sparkle! Instead, I've been living it up with 10 pillows downtown! After the phone call, I showered, dressed and I got to meet my friend Kim, and my wonderful son, David, downtown. I was so tired that I wasn't much good, but we sat on the steps of Pioneer Place, drinking health infused smoothies and had a good heart to heart. I also was blessed with wonderful, warm "David hugs" that I have missed so much! That kid can hug like no other! Before we parted way, he said to me, "And Mom? I just want you to know that I'm really happy!" Wow. After all is said and done, what could be more important? I think he has it nailed. I always taught him that the key to life is one thing. Happiness. If I ever taught him anything, I'm glad he remembered that. So... Next up is the results of the MRI. It's a little scary for me, as this is what my Mom was diagnosed with two years before she passed away from cancer in that very area. I know it's probably not that. I know that in my heart. It couldn't be! But, still? It is a bit scary. I'm a little afraid for the phone call that will tell what they find from the MRI they took late at night on the night when the moon eclipsed, and I couldn't watch because I was in some stupid machine at OHSU. I want my memory of the 10 fluffy pillows to be a good one, and if they call and tell me bad news, then the memory of those pillows that were so wonderful and soft to fall into will become as hard as a rock. That can't happen! Oh my! I have suet hanging out of my window, not 2 feet away and a Northern Flicker just landed on it and is taking a taste! Amazing! So close that even I can see! I sure wonder when my hummies will show up. I can't wait! Maybe... maybe my eyesight will be better after these shots! Maybe I'll be able to see birds better, and fish in the river, and.... Maybe... just perhaps, they'll be able to get rid of this tumor. Maybe the scleral patch won't hurt. Maybe Humpty Dumpty will get put back together again? I hope so! People say I'm strong. I don't get that. I'm not that strong. I mean, what am I supposed to do? I just put one foot in front of the other, and frankly, I have no choice! I have to do what I have to do, so I might as well do it and smile! Besides that, I get to stay at a nice hotel during my surgery! I have two more free nights! Yay! OK... It's girl's day, today and I get to have my hair done. Nothing like a good hair-do for surgery! Life! What a ride! Hold on! "Kilchis? Want to come with me, or stay with Daddy?" He looks at me, wags his tail, turns his head to find the source of "Daddy" fishing on the river, and then he turns back to me. It's as if he says, "I would love to stay, and I do love you, Mom!!" 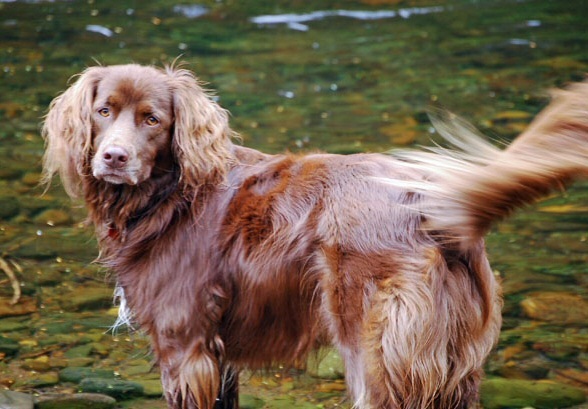 and runs off to stay down on the river, rather than head back to the house, with me. It makes me giggle, every time. I love talking to dogs! I just get tired faster than Bill, and of course a dog would love to stay on the river! It simply amazes me how much certain dogs that we are blessed with during our lives, understand English! Kilchis is the most fluent of any dog that I've ever had! He understands everything! I've always spoken to him as a person, no matter what I'm doing, and he does, truly understand me! Kilchis droops when I say I have to work. He really gets depressed when I get out a suitcase, and especially when I head for the door and say, "I'm sorry, but you have to stay home". The "stay home" part really rings out to him. He cries. I try to sound happy, but frankly, when I get in the car to leave, I cry, too. He loves chocolate like no other, and yes, I know that dogs aren't supposed to have chocolate, and yes, certain dogs don't do well with it, but Kilchis seems fine about chocolate. Rev does not. After dinner, if I dare mention the word "chocolate" I'm in for trouble. And oh, how he loves chocolate! "Cheese" is one Kilchis knows, but Rev does not. Whenever Kilchy and I want to have a sneaky snack without Rev's rambunctious (and rather rude) interruption, I tell Kilchis "cheese" and we both head to the office to have our snack in secret! When Bill or I head to the mud room for our boots, chaos erupts. It's and excited dog tornado! Even Rev knows now what that means. We are going to "go" "out" to the "river" "outside" "fish"... any of those words and more are now abandoned from our language, or else! We try to spell it out, but it's useless. Kilchis has obviously studied English and passed 121 and 122, because if we spell "R I V E R" the kitchen explodes with waggly tailed barking and intense whining! Help! I'm old! All I want is one minute to lean over and slowly get those boots on... and in peace, thank you very much! If I dare to lean over to pull them on, Rev sticks his nose in my eye, and Kilchis barks so loud I can't hear myself think! I'm going out, soon, so I begin planning my approach to the mud room, carefully. How can I do it without such a fuss? Oh, hey! I played the piano for the first time in ages, this weekend! It was my Birthday, and I was darned if I was going to spend it on the computer, but you know what? I did. Just in a different way! I played the piano into a digital recorder, and uploaded it! It was fun! I did three little things, and they are all goofy, but fun! Try it! One, Two, and Three! You must have Windows Media Player to listen, though. I don't know how to do it any other way. :) I was lucky to get this going! So, instead of telling him no last night, I turned to him, lifted his ear flap so that Bill wouldn't hear, and whispered to him, "Kilchy! Lick Daddy! Lick Daddy!" He stopped and looked at me for a second to process the English. Then, you could just see clarity wash over him! With two slaps of his waggly-tail, (which I know full well meant that he understood) he broke out in laughter! He thought it was darn funny and a great idea! He immediately turned to Bill, approached his bare arm, and started in with the licking! Too funny! I laughed so hard I nearly died! I just love you, Kilchis! Now, whenever Kilchis bugs me, I'm going to tell him to go lick Daddy! -And Bill is so kind that he was defenseless. He cannot tell a dog no. Especially Kilchis! But, I keep hearing this taunting from childhood, "Stick a thousand needles in your eye!" And, although I only get two or three, the thought makes me hyperventilate. I can DO surgery. Go ahead and cut me up, but a needle... while I'm awake? They say that the hardest part is watching it go in and feeling it push, tug, and then the fullness, after. Can you imagine? It sounds like torture! I sure hope it helps! I've got myself pretty wound up over it, tho. God will take care of me, and He only gives us what we can handle. Can you just lighten up on me a bit, though, Father? I'm off to pre op. What a beautiful day it is! This is Ifish Member, "Razor Clam" who won the Ifish contest "First caught Springer" contest! edsr took the photo at the Salty Dog convention, where I caught up with Razor Clam and gave him his prize! Congratulations! There is another prize to be awarded for the second springer. Get out there and get it! Details, here! I have turned off my private messages, as I'm leaving for surgery. This one won't be so bad. Have a nice day! One day at a time!